Strategic collaboration with Africa has become a priority in the global North, East, and West. Powers that once saw the African continent primarily as a source of raw materials now focus on “partnership” and “development,” following the lead of the U.S. African Growth and Opportunities Act (AGOA) in highlighting mutual benefits of investment and trade. . China, in particular, has rapidly increased its ties to the continent in recent years, with the Forum on China-Africa Cooperation (FOCAC), formed in 2000, as the primary institutional vehicle for its strategic engagement with sub-Saharan Africa (Pigato & Tang, 2015). China’s trade with Africa has increased from about $10 billion in 2000 to $220 billion in 2014 and was approaching $300 billion in 2015 (China Daily, 2015). Steven Kuo (2015) reports that because of Africa’s price-sensitive market, the continent’s telecommunications and infrastructure development has become reliant on Chinese technology, which is competitively priced and enjoys strong back-up service compared to its Western competitors. Africa has also seen huge growth in smaller Chinese investors in food outlets, retail shops, and textiles. China, on the other hand, mainly imports minerals from Africa, along with smaller amounts of oil and agriculture products. It is also estimated that more than 1 million Chinese, most of them labourers and traders, have moved to Africa in the past decade (Lu, 2013). Like trade arrangements with the West, China’s growing role in Africa has drawn criticism. This has included claims that China is in Africa only to access natural resources, that it wants to buy up Africa’s land, and that it mainly employs Chinese rather than local labour (Esposito & Tse, 2015), although some researchers describe these claims as “myths” (Brautigam, 2015). Other critics have argued that many Chinese companies provide sub-standard services and products and under-sell and weaken local competitors. China has also been severely criticized for its willingness to work with autocratic or less-than-transparent regimes, as in Zimbabwe and Zambia. 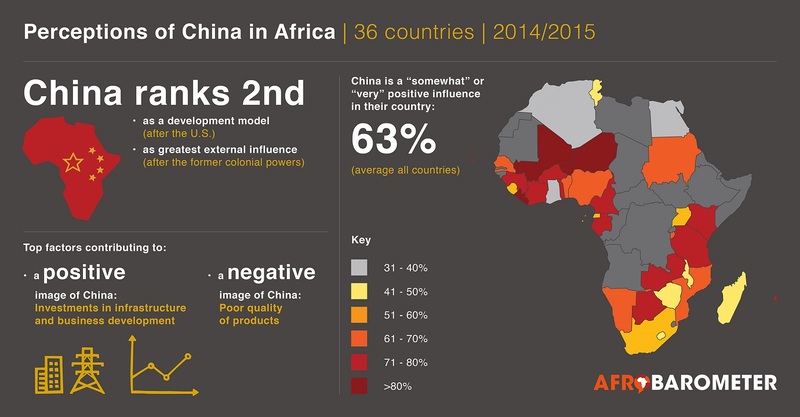 How do Africans see China’s foreign investment and influence in their countries? Findings from Afrobarometer’s 2014/2015 surveys in 36 African countries, which included a special series of questions on China, suggest that the public holds generally favourable views of economic and assistance activities by China. Africans rank the United States and China No. 1 and 2, respectively, as development models for their own countries. Remarkably, in three of five African regions, China either matches or surpasses the United States in popularity as a development model. In terms of their current influence, the two countries are outpaced only by Africa’s former colonial powers. Public perceptions not only confirm China’s important economic and political role in Africa but also generally portray its influence as beneficial. China’s infrastructure/development and business investments are seen as reasons for China’s positive image in Africa, though that image is tainted by perceptions of poor-quality Chinese products. For the full report, click 'Download now' below. Click here for the press release. President’s performance, citizenship, land ownership and the TRC’s mandates: What do Liberians say?